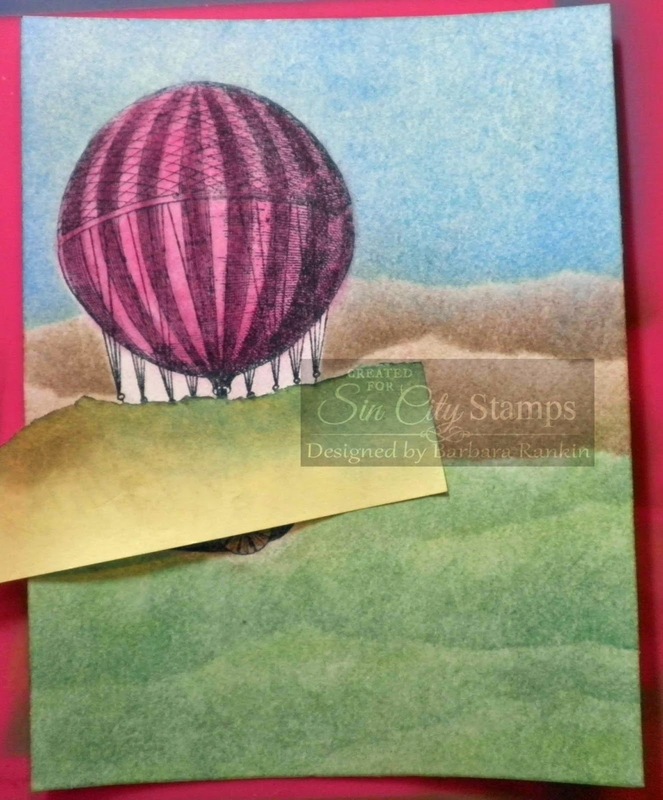 Hello everyone, Barbara here today for more fun with Sin City Stamps and our sponsor this month, Pan Pastels! If you have been following along with the team this month, then you know, by now, how wonderful these pastels are, and how easy they are to use. I absolutely love this product and cannot say enough good things about it. 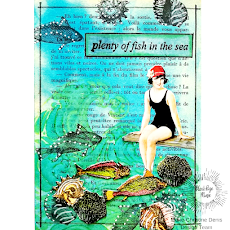 For now, though, I want to show you how easy they are to use to make a fabulous and simple background for an art journal, canvas, or even a greeting card, as I have done here. 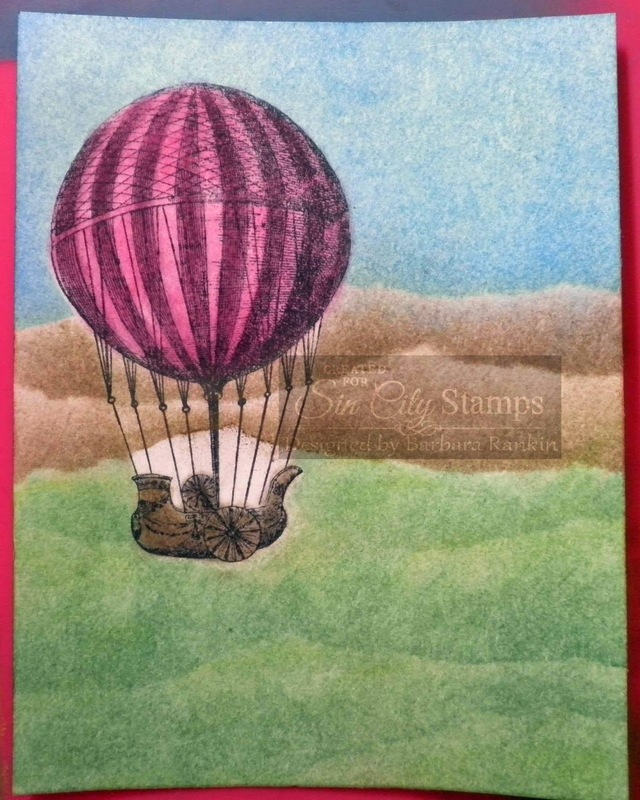 I have seen many artists use this technique to make a balloon dimensional, I mean, really dimensional, and I knew as soon as I saw this Up Up and Away 2 stamp set that I wanted to finally give this a try, too. I think it turned out fabulously, don't you? 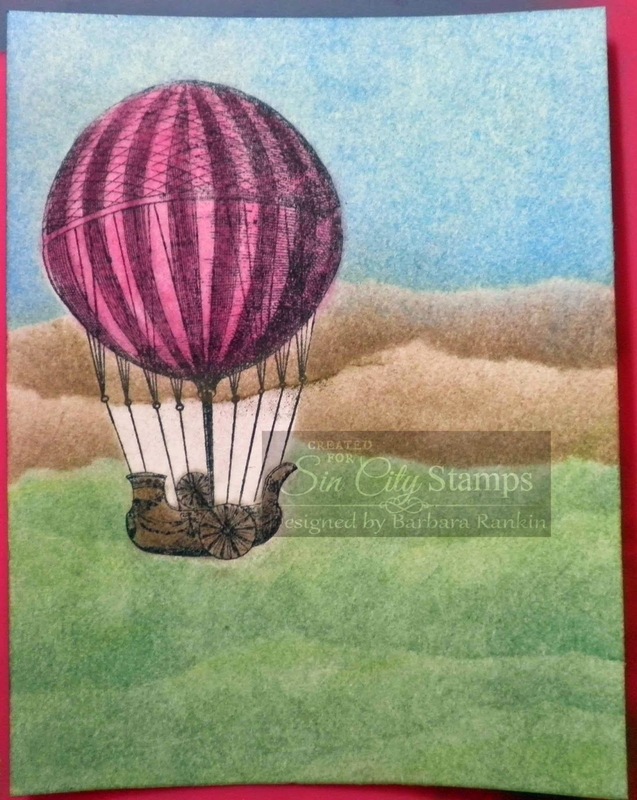 Stamp hot air balloon onto 4-1/4" x 5-1/2" white card stock and post-it note with black ink. 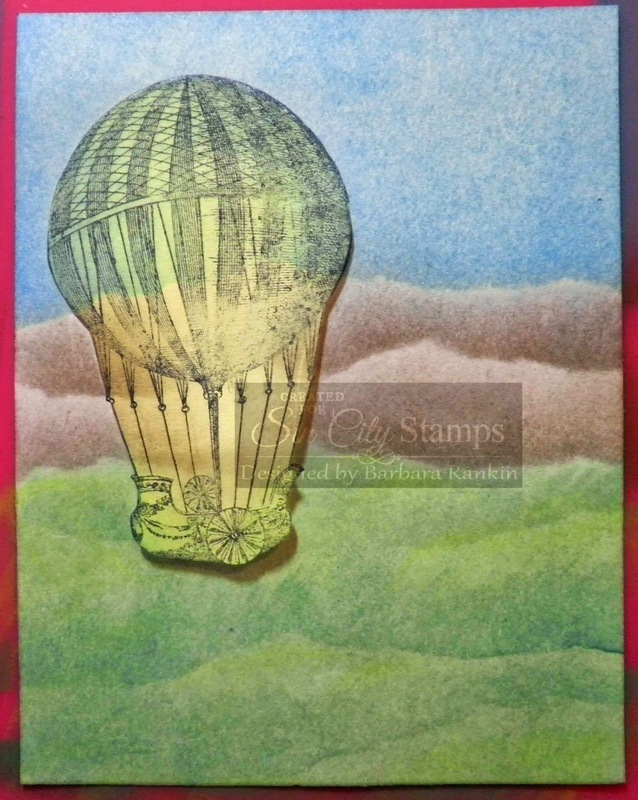 Continue stamping top of balloon image five times onto second piece of white card. 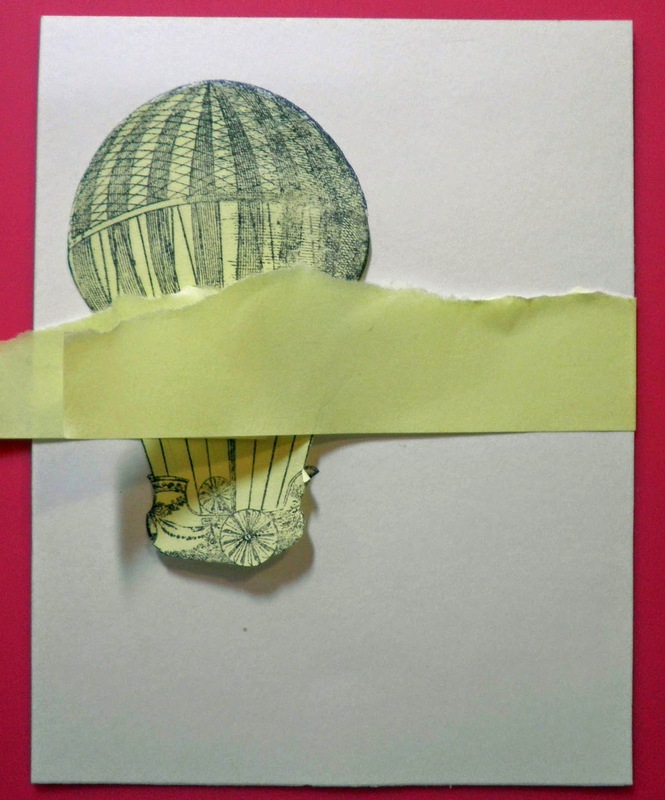 Cut out post-it note image and place over stamped image to protect it. 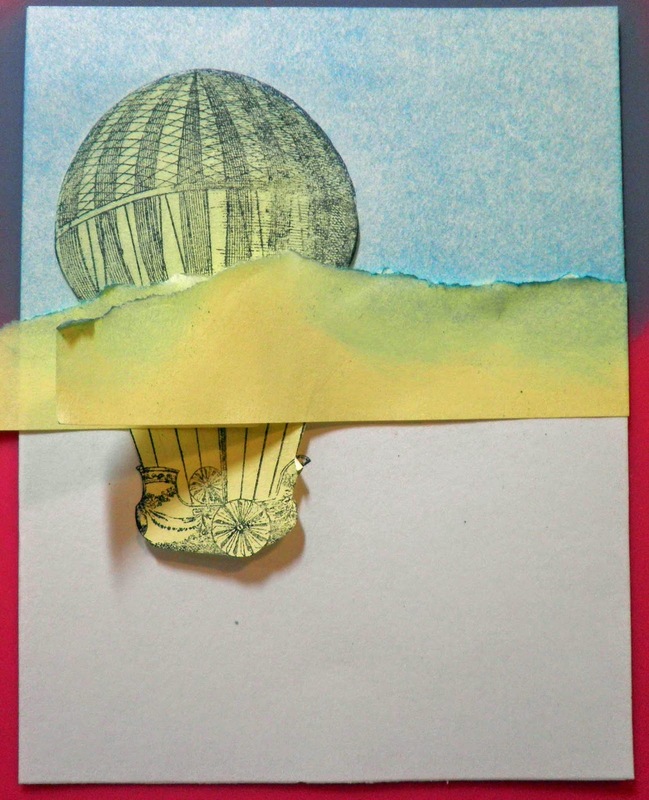 Tear two strips from post-it note and layer over balloon image post-it note, as shown. 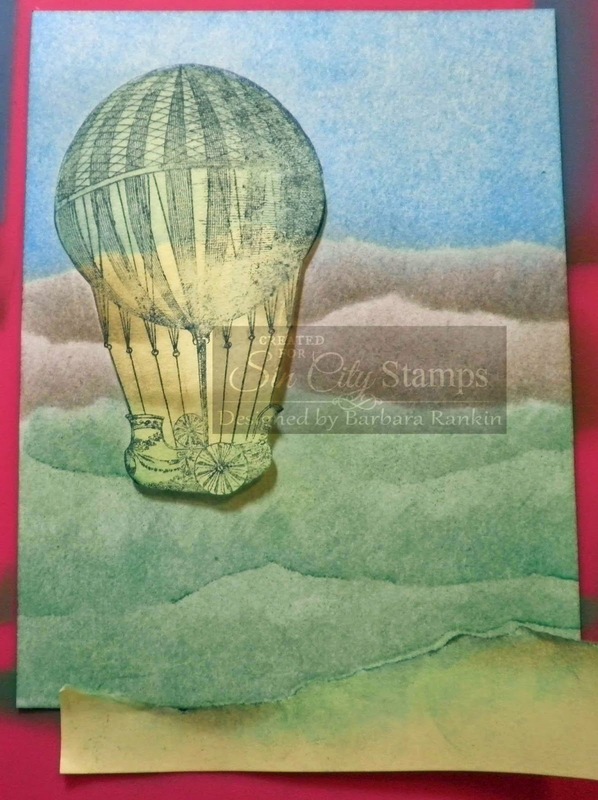 Using large Softt sponge, add Turquoise PanPastel over top portion of card stock to form the sky. 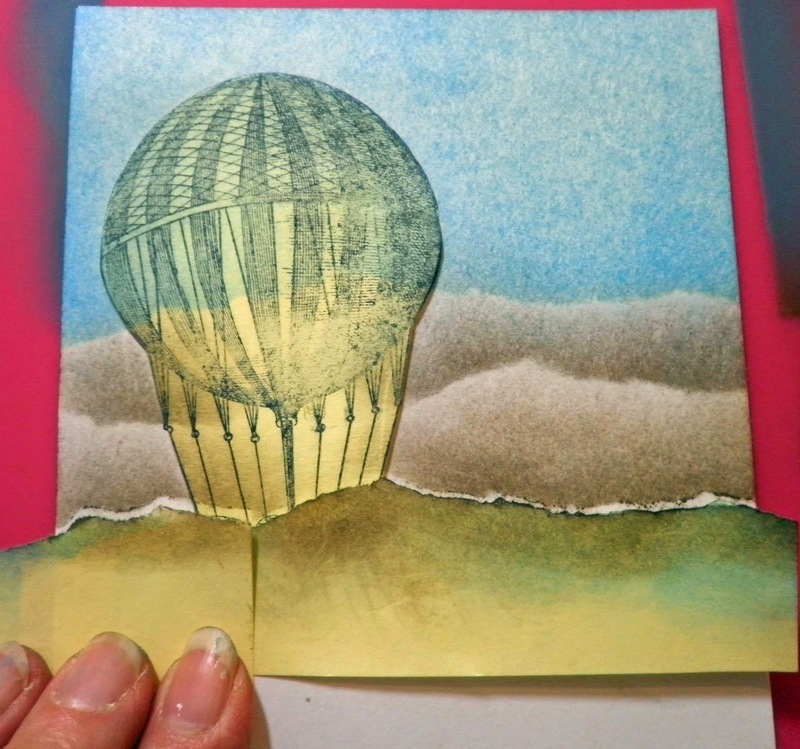 Add Ultramarine Blue PanPastel near post-it note edge and around the card stock edges for depth. Move post-it note strips around and begin adding Raw Umber PanPastel to form hills and valleys. 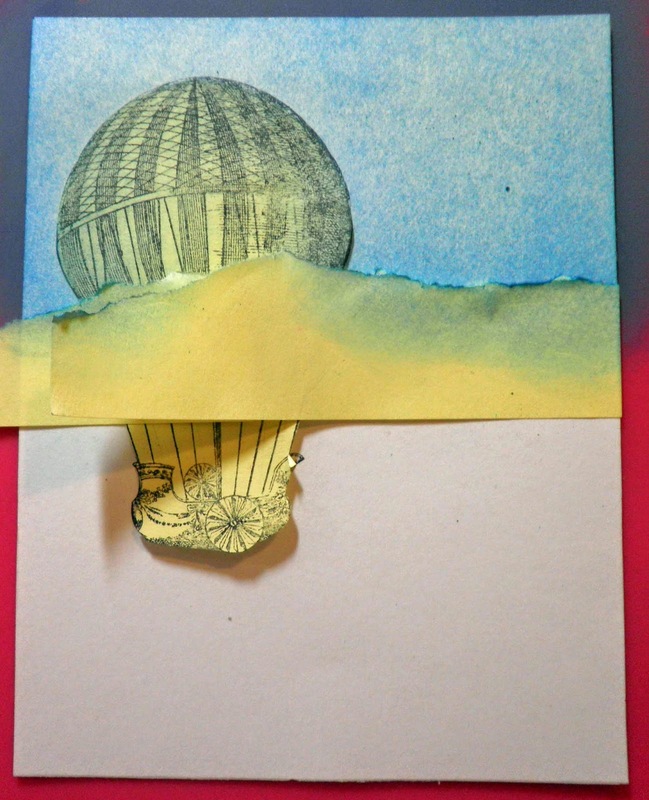 Continue this step, adding the color from the post-it note and blending upwards towards the already colored areas. This will give depth towards the bottom of the hills. 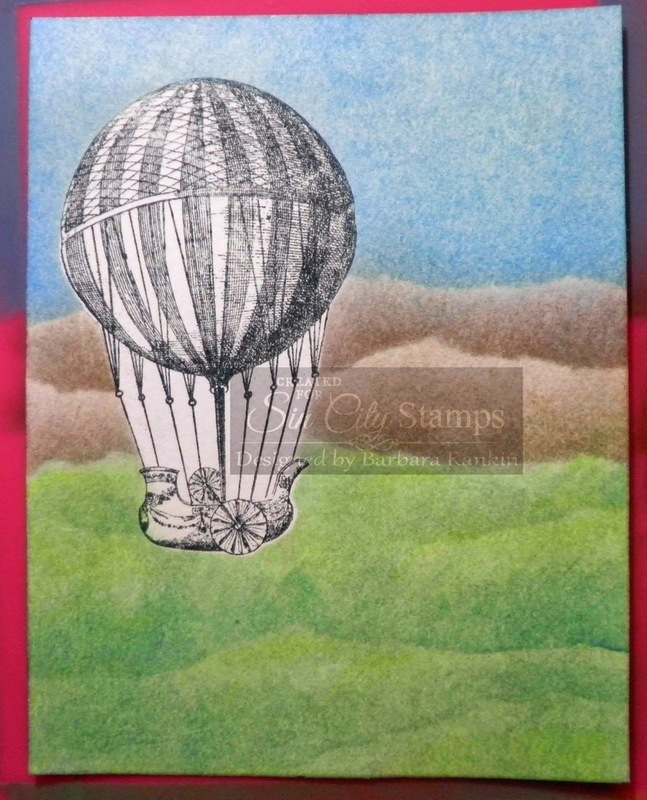 Color the entire remaining bottom portion of the card stock with Permanent Green PanPastel, then add green hills and valleys using the torn post-it note. Continue moving the post-it note around until you achieve the look of rolling hills. Add a tiny amount of Bright Yellow Green PanPastel to your sponge and gently dab over the lighter areas of the hills. 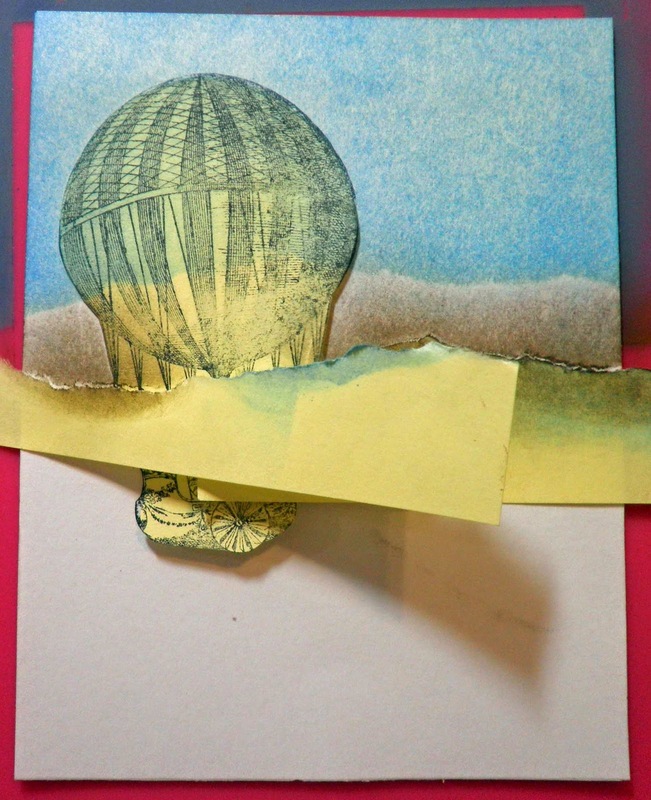 Once you like what you have colored, spray a coat of workable fixative over the entire piece, leaving the balloon post-it note in place. This will preserve the work you have already done. 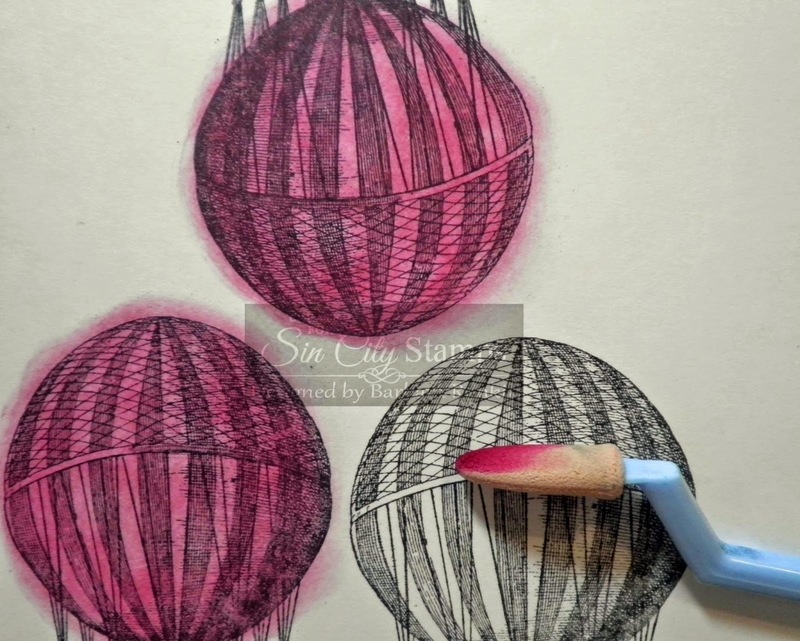 Using the Sofft Tool Knife and cover, apply Magenta PanPastel over balloon. 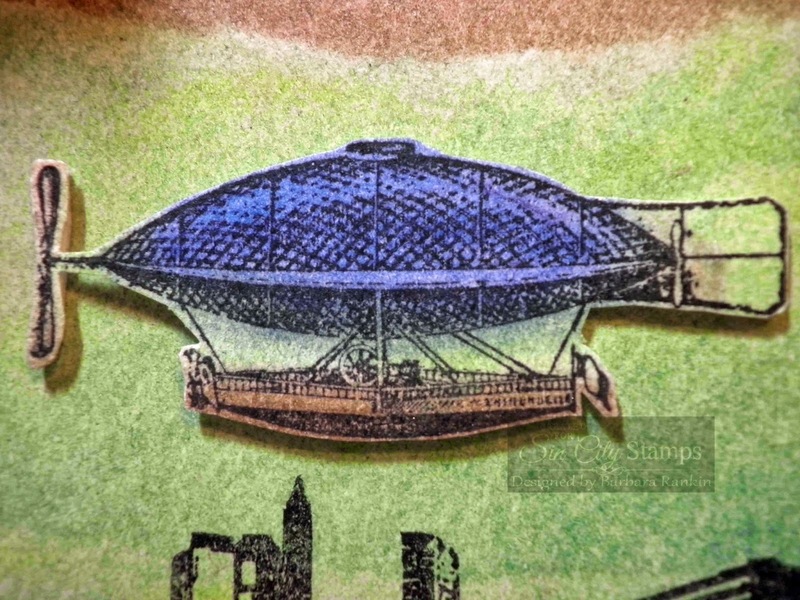 While you have this color on your knife, color the five balloon images on the scrap card stock. Do not worry about staying inside the lines since these will be cut out. Now use Magenta Ex. 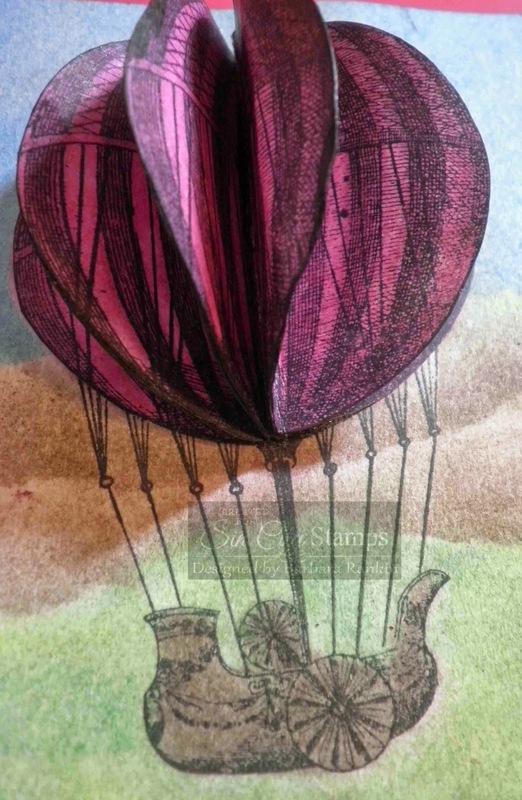 Dark to color in the darker stripes on each balloon. No need to clean your sponge. However, when switching between different colors, all that is necessary to clean your sponge is a few swipes across a scrap piece of paper or, my favorite, a paper towel, and you are ready to pick up another color. 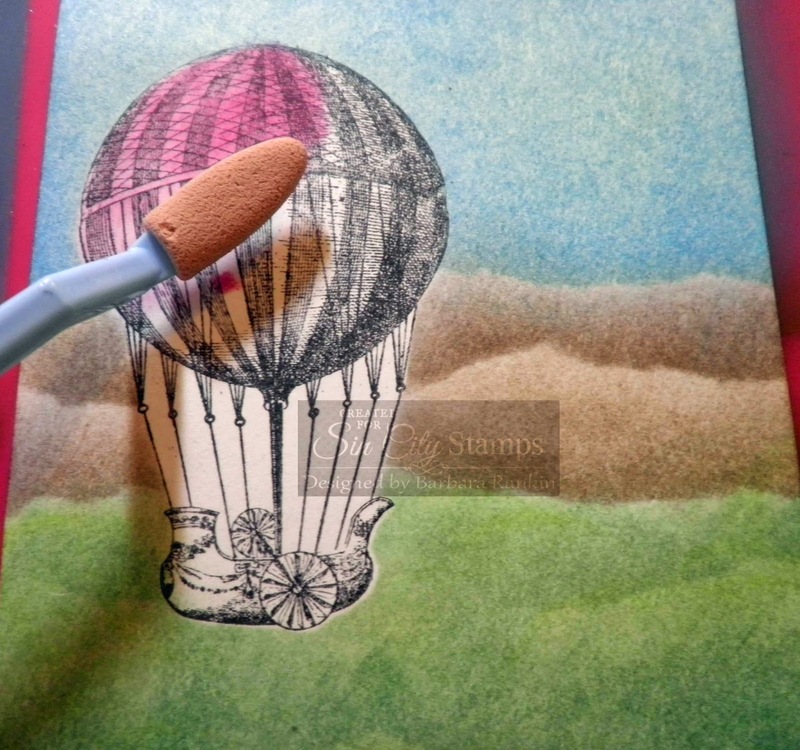 Use your knife tool to add Raw Umber PanPastel over the balloon basket, adding tiny touches of black to add depth. In this close-up, you can see where I went outside the lines and got some on my green hills. As you can see here, I cleaned it up a bit with just a white eraser without disturbing the color beneath since I had sprayed the fixative over it. 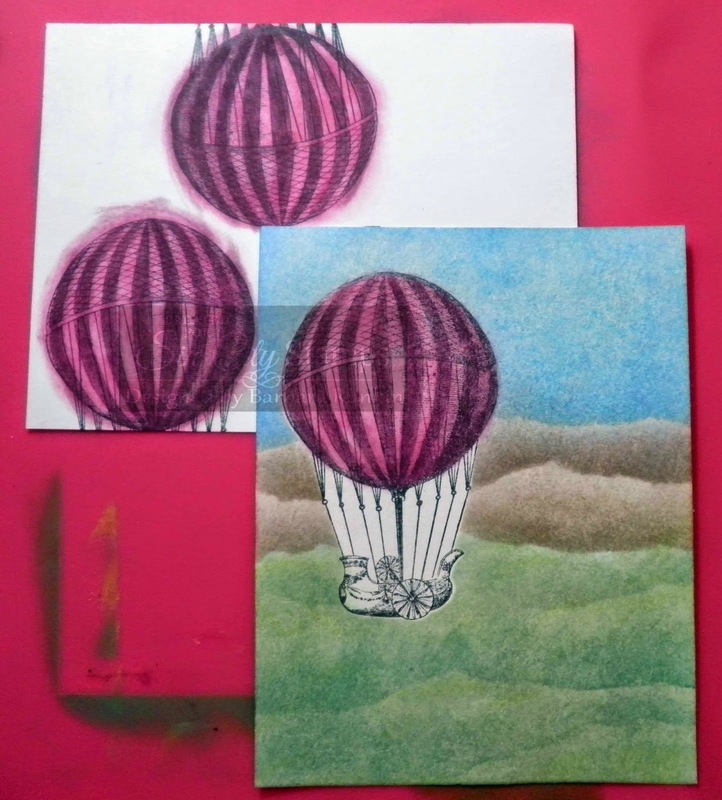 Spray everything again with your workable fixative before cutting out the balloons. Fold each balloon in half down the center and set aside. 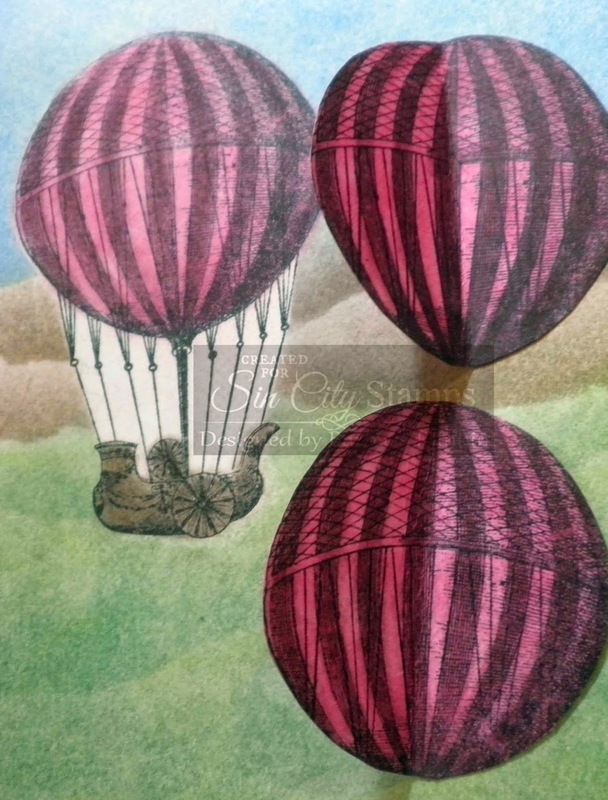 We still have to finish coloring in the area between the balloon and the basket, so use the same technique as before, coloring with the Raw Umber for the hills and the Permanent Green PanPastels for the grassy hills. Voila! It's as easy as that. Spray one last time with the workable fixative. 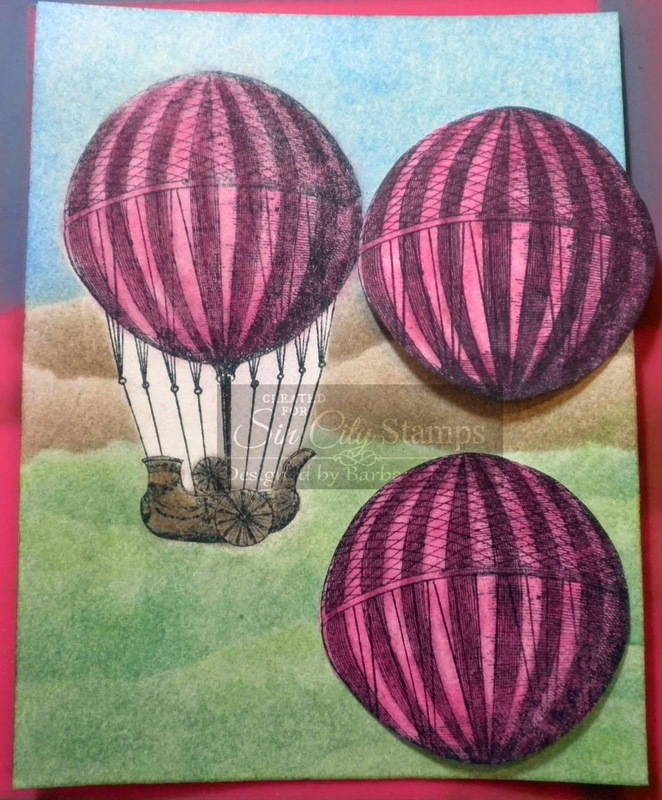 Ink the edges of the balloons with black ink or marker and adhere to the stamped image. 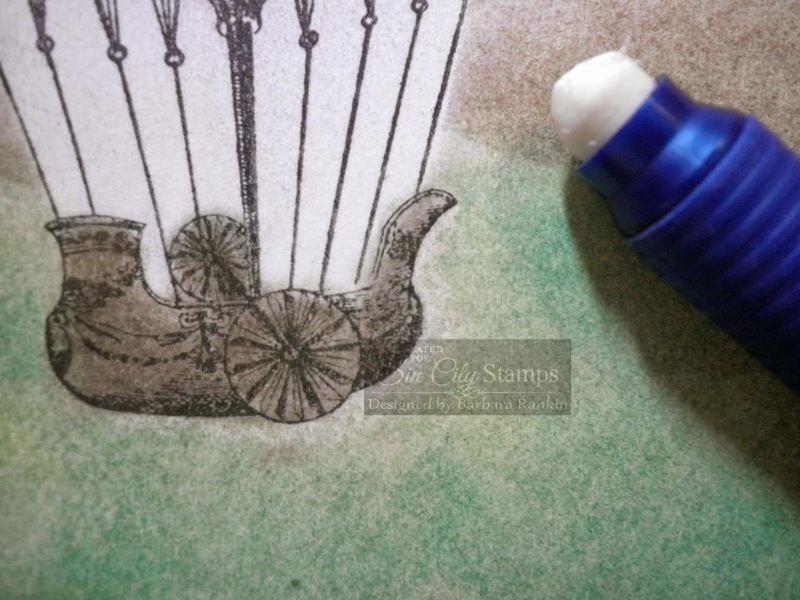 Stamp scene from Urban Grunge along bottom of card stock with black ink. 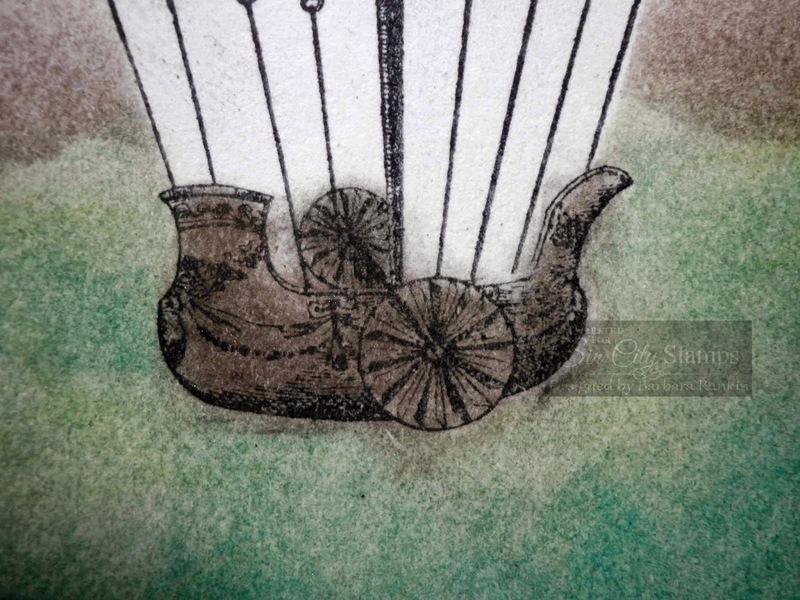 Stamp scroll banner onto scrap white card stock with black ink. 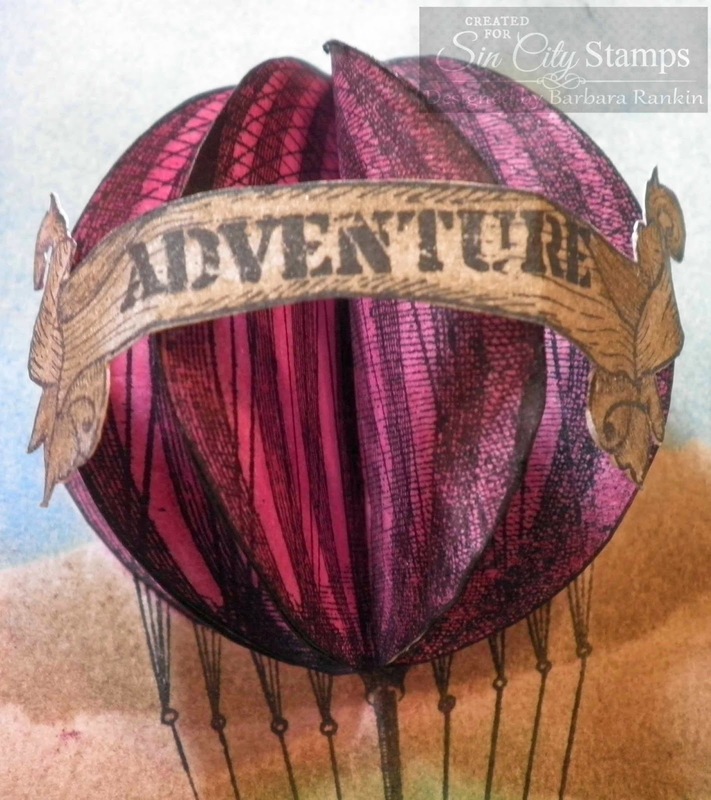 Use a stamp positioner to stamp Adventure onto banner in black ink. 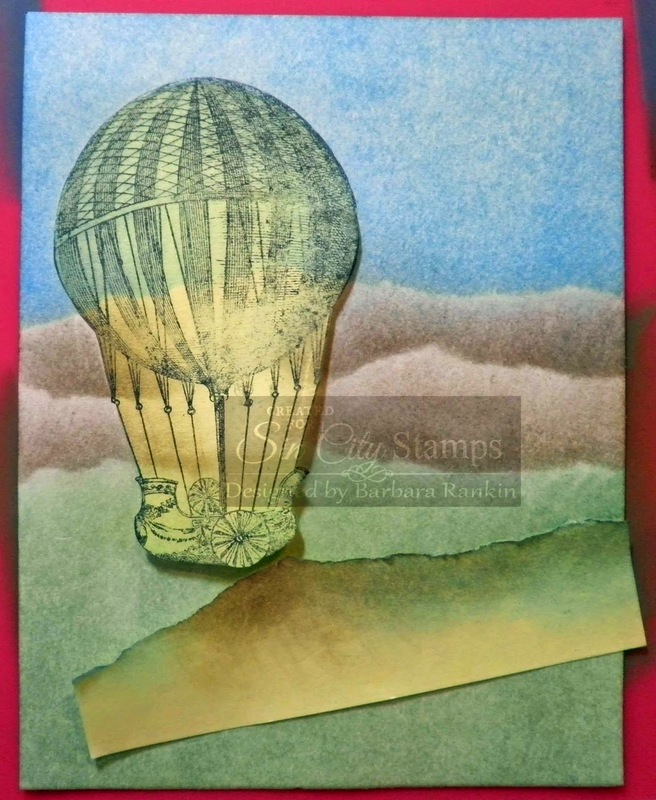 Sponge Raw Umber PanPastel over banner, cut out and adhere to balloon. 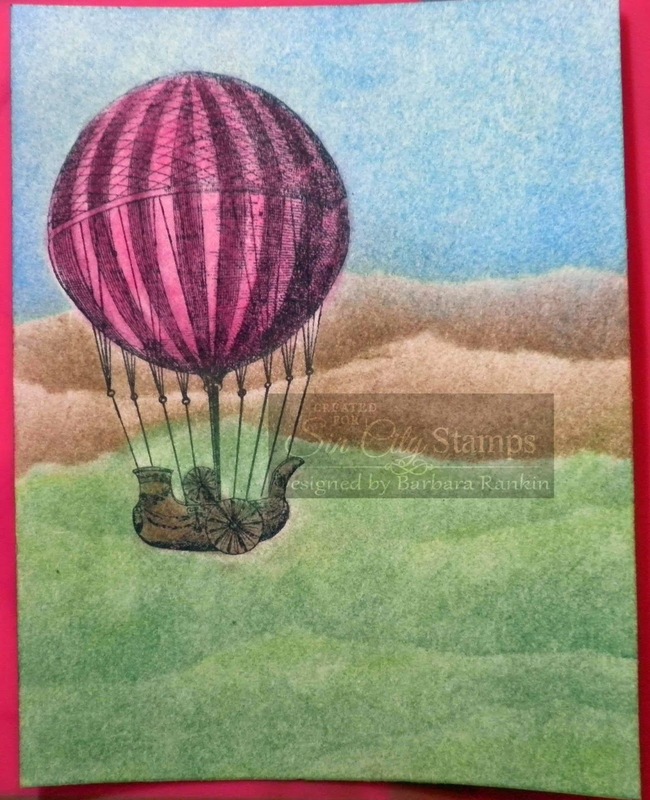 Stamp small balloon onto scrap white card stock with black ink. Color, as shown, with Ultramarine Blue, Permanent Green, and Raw Umber PanPastels. Fussy cut out and adhere with foam dots. 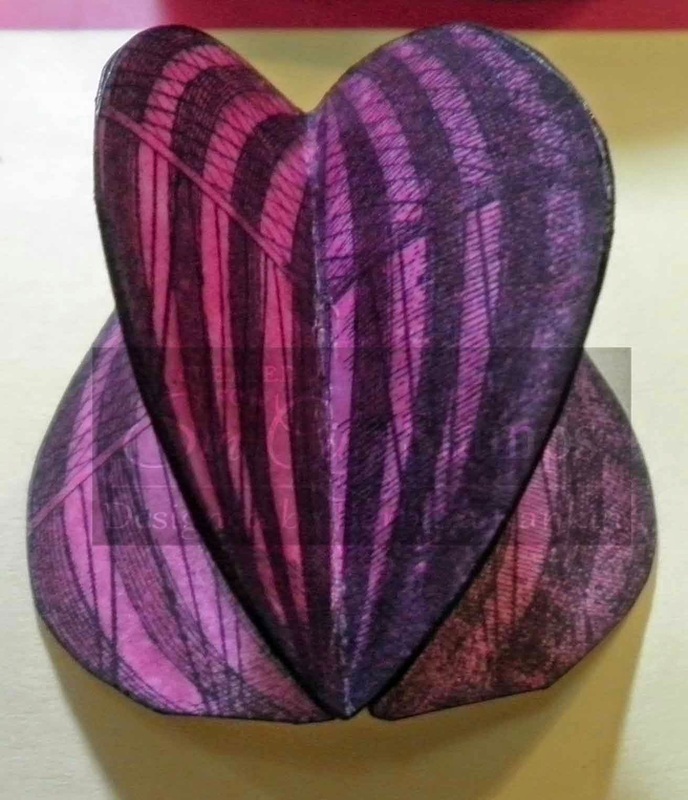 Cut purple card stock to 4-1/4" x 5-1/2", distress edges and curl two corners, layer onto blue A2 card. Trim stamped layer to 4" x 5-1/4" and adhere, curling corners as with previous layer. 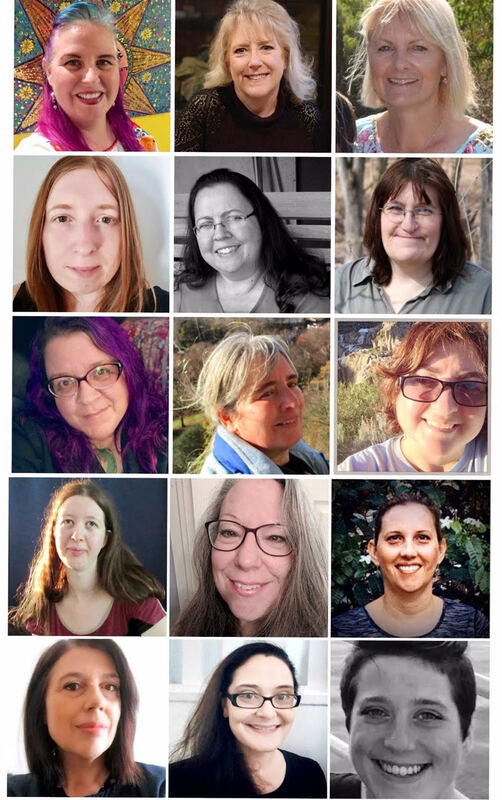 Here it is again for your convenience. Sorry for all the photos, but I wanted to show the progression of coloring, and without video, this seemed to be the only way. If you are still here, I appreciate your tenacity to stick with me. I sure hope you enjoyed my card project today, and I hope I have inspired you to give Pan Pastels a try in your next art project. 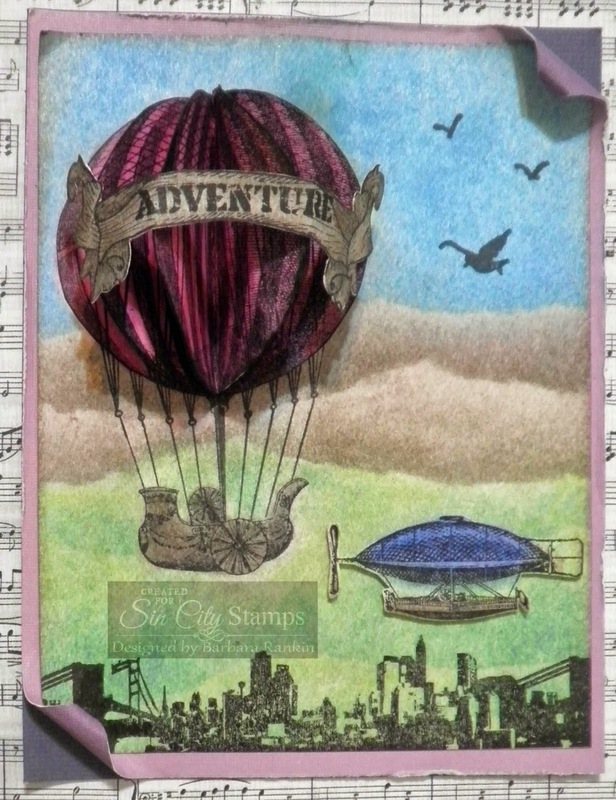 And be sure to check out the awesome products at Sin City Stamps, too! Great detailed instructions. Great project!! WOWSER!! what a amazing card..